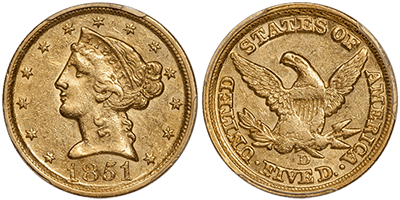 For just 23 years, the Dahlonega Mint in Georgia produced a small yield of U.S. gold coins—thus making these coins incredibly popular among numismatists and investors alike. Despite these low mintage figures, we were able to secure a limited selection of Dahlonega gold coins available exclusively for ASI readers! Not many people are aware that the first American Gold Rush(es) occurred in the South as far back as mid-to-late 1820’s. Thousands of miners migrated to North Georgia and Western North Carolina to claim their fortunes, as the largest quantities of gold on the East Coast were discovered in these regions. By 1835, the U.S. decided to construct Southern branch mints in Charlotte, New Orleans, and Dahlonega (Georgia) in order to facilitate trade and process the new gold being discovered. By 1838, these three Mints had officially opened, and all but the New Orleans Mint were ordered to only strike gold coins. The Dahlonega Mint was operational from 1838 through 1861, and it closed as the Civil War began, never to re-open. This facility made gold dollars (from 1849 through 1861), Quarter Eagles (from 1839 to 1859), $3 gold pieces (only in 1854), and Half Eagles (from 1838 through 1861). Mintage figures for nearly all issues from this Mint were low, and the survival rate tends to be minimal; often just 1–2% of the original amount produced. Dahlonega gold is exceptionally popular among investors, and demand in 2017 has been the highest we’ve ever seen. Our rare U.S. coin expert, Doug Winter, is widely recognized as the world’s leading expert on Dahlonega gold and has written the standard reference work on these issues: Gold Coins of the Dahlonega Mint 1838-1861. Because Doug is an expert on Dahlonega gold, you’re guaranteed to receive top-quality investment coins. 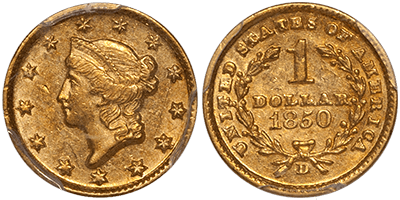 Doug has sourced a beautiful selection of some of the best values in Dahlonega gold coins for ASI readers, with an emphasis on gold dollars and Half Eagles. Some of these coins are among the top 10 highest graded coins available of their type, and are excellent pieces to add to your portfolio. And, if you “get the bug” after your first purchase, and want to pursue a small or in-depth collection of Dahlonega gold, we can help you find the perfect complements to your investment. 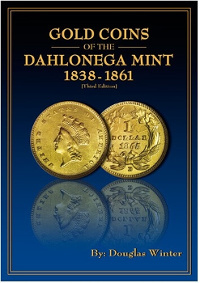 As an added bonus, you’ll also receive a FREE autographed copy of Doug’s book Gold Coins of the Dahlonega Mint 1838-1861 with any purchase from the below collection. You can secure your Dahlonega gold by calling us at 800-831-0007. The 1850-D remains the most overlooked gold dollar from Dahlonega, and it is among the scarcer Type One issues. In AU58, this is a legitimately tough coin to find, and it is very rare (and expensive) in Uncirculated. This lustrous example shows light wear only on the high spots, and both sides are toned in soft natural reddish-gold hues. A few shallow abrasions rest in the left obverse field, but this is a solid coin for the grade with considerably more originality than usual for this issue, which is generally seen washed-out and unappealing. Only one PCGS AU58 1850-D gold dollar has sold at auction since early 2006, and it brought $5,640 as Heritage 2016 ANA: 5722. If available, a PCGS MS61 would cost at least double the asking price of this nice AU58, and we doubt whether you would see all that much difference in quality. 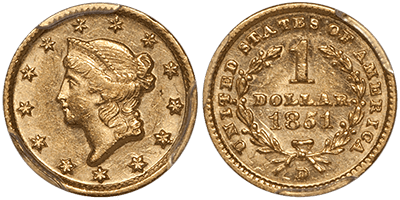 The 1851-D is the second most available gold dollar from Dahlonega after the 1849-D, but it is many times scarcer than this issue. Properly graded AU58 examples seem like a very good value at current levels, and they are not often available. This well-struck piece shows light wear and has a pleasing yellow-gold color. There are two interesting incuse stars at 6:00 to 7:00 on the reverse, which are the result of clashed dies and are common on this date. This spectacular variety is the result of two different mintmark punches with the first being too high and too far to the right. The 1846-D/D is actually more available than its counterpart, the 1846-D Normal Mintmark, but it is far more popular. 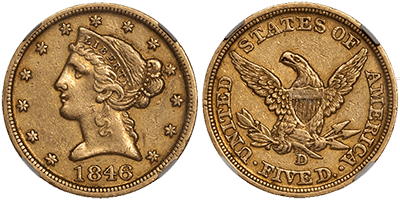 The 1846-D/D is very hard to locate in collector grades with original color and choice surfaces; as evidenced by the very low CAC population. This is a totally natural-appearing example with deep russet and green-gold hues accentuated by dirt and “crud” in the recesses. While there isn’t much evident luster, the grade is supported by crisp detail and a lack of extensive wear. No CAC-approved AU53 1846-D/D Half Eagle has ever sold at auction. An NGC AU53 brought $4,230 as Heritage 10/16: 4118. CAC has approved 4 in this grade with 3 finer. In AU55 and higher grades, the 1851-D is among the rarest Half Eagles from this Mint. It is exceeded in high-grade rarity only by the 1842-D Large Date and the 1861-D. This semi-prooflike example is fresh to the market, and it exhibits bright yellow-gold color with light wear and enough luster to suggest a higher grade. As is typical with this date—and even more so with this die variety—the strike is soft on the obverse with a good deal of flatness on the hair below LIBERTY and on the corresponding reverse. There is very little actual wear, but the obverse shows scattered shallow contact marks; the reverse is cleaner and quite choice. No CAC-approved AU55 1851-D Half Eagle has ever appeared at auction. 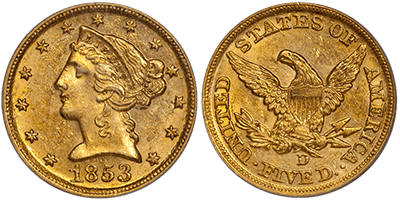 This date is almost never seen choicer than AU55 to AU58, and this specific coin should create considerable stir among Dahlonega Half Eagle experts. CAC has approved 4 in this grade with just 2 finer (both in AU58). The 1853-D is the most available Half Eagle produced by the Dahlonega Mint. It is rare in Uncirculated with around 20 or so known, mostly in the MS60 to MS62 range. Fewer than one-half of the known Uncirculated 1853-D are CAC-worthy, as many have been fiddled with at one time. This frosty example is strictly a "new" coin with no wear or luster breaks. It is uncommonly well struck with no weakness at the borders and very strong centers. Both sides show nice natural medium golden-orange hues with some slight green-gold undertone seen on the reverse. I have seen inferior coins in MS62 holders, and the few scuffs in the fields (mostly on the obverse) are shallow and do not detract. This exact coin (see below for pedigree information) is the only CAC-approved PCGS MS61 1853-D Half Eagle to sell at auction. This is an absolutely perfect coin to serve as a type example of a high-quality Half Eagle from this mint in a type set or, even better, in a seven-mint Half Eagle set. Gold coins from the Dahlonega Mint can be hard to come by, and the selection we have available for you was meticulously chosen by our rare coin expert Doug Winter, who has dedicated much of his career to studying coins from this Mint. With every coin purchase, we’ll add in a FREE autographed copy of Doug Winter’s book Gold Coins of the Dahlonega Mint 1838-1861 for you to reference in future purchases. To invest in Dahlonega gold coins, please call us at 800-831-0007 or email us. *Prices subject to change based on market fluctuation and product availability. Prices reflected are for cash, check, or bank wire. Offer expires Friday, September 29, 2017.